Cal Crutchlow claims Marc Marquez would not have won the Jerez MotoGP race so easily if the reigning champion had been using the same Honda bike as the LCR rider. The factory Honda team introduced a new carbon swingarm part at the beginning of the 2018 season, and both Marquez and his works team-mate Dani Pedrosa used it at Jerez. But Crutchlow, who signed a contract with HRC last year and is riding a 2018-specification Honda this season, hasn't received the new part. 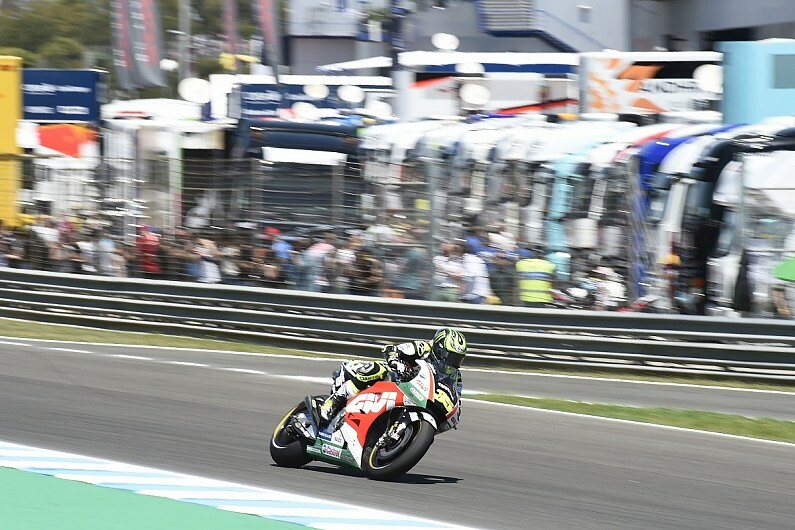 Crutchlow said that while he had the pace of Marquez and Pedrosa during Friday and Saturday - where he took pole at Jerez - in the lower-grip conditions of the race he felt had to push to match the "cruising" Marquez, which led to his eventual crash at Turn 1 while running fourth. "I don't think Marc would have won so easy if he had my bike today, but that is my opinion," said Crutchlow. "He would have had still a great shot at winning the race. "[But] I was pushing to make up ground - I have the data, I looked at every video in Texas [the last round], every video here. "On Friday, they were leaving black lines everywhere, [on] Saturday morning sometimes they do black lines, [it] depends on which bike they are on. "Marc was absolutely cruising today and you can see I had the pace all weekend, but when the grips are lower we didn't have the pace because we don't have the same equipment. "I am not allowed to say directly [which] part, but my bike is very good." When asked on Saturday if the carbon swingarm makes a big difference, Marquez claimed it does not, but confirmed that it does provide a bit more grip. "Basically on this circuit we don't feel a big difference, but [it] looks like we [have a] little bit more grip with the used tyre," he said. "[Saturday] morning I did the best laptimes with the aluminium one so is no big difference. "[Saturday] afternoon I use the carbon one because it gives [a] little bit extra grip, but [it] is a very small difference." On Saturday, Crutchlow said that he accepts he won't get to use the carbon swingarm as he is competitive enough without it. "I have to obviously be very careful because I'm supported very well by Honda," he said. "I'm pleased with my package, I'm pleased with the support I get. "I'm not going to get it, it's as simple as that, and I'm not going to get it for a long time, especially now I'm beating them. "That's the way it works. I'm not stupid."